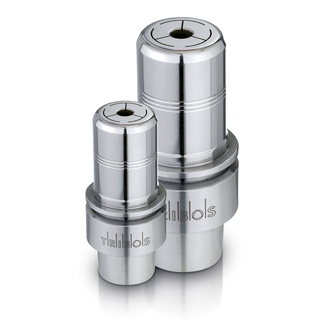 The HSK-E polygon collet chucks have been developed for precise and safe cutting, also at high speeds. The stable, rotation-symmetrical design has an excellent concentricity of less than 3 μm. This permits high quality milling results at a speed of up to 60,000 RPM. With passive vibration damping, the life of the high frequency spindle and the cutting tool is significantly improved.